The iPod Mini was a groundbreaking Apple product, but it relied on a tiny Compact Flash-sized hard drive called a MicroDrive for its 4Gb storage. Many of these units are now very cheap to buy as spares and repairs, but you can you turn them into a new upgraded 64Gb iPod, with a little time and tech knowledge. Although the iPod Mini was revolutionary in many ways, within a year the Mini was replaced by the solid state iPod Nano. The Mini was a good little iPod, but it was not their favorite son. It had a tiny hard drive in it, and these were prone to head crashes and drive errors. 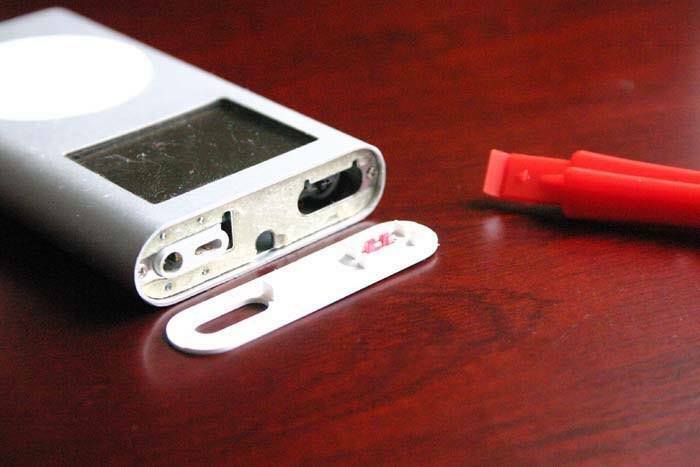 In this article, we’ll discuss how to get into the iPod Mini, replace damaged or tired batteries with better ones and replace the old hard drive with solid state memory with the bonus of increased capacity. 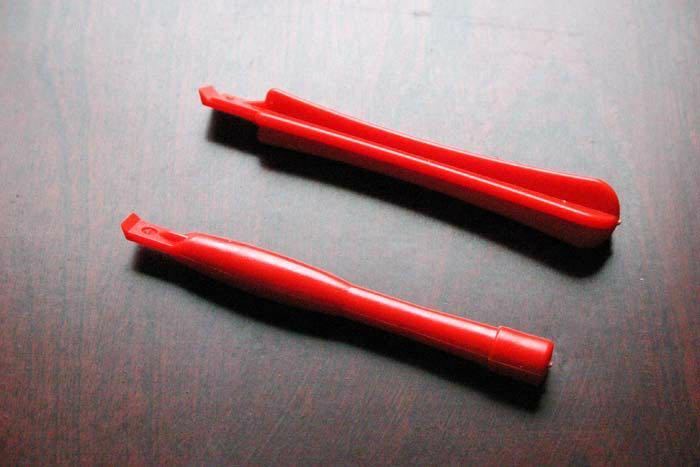 You will need two tools: a spudger (a specialized plastic tool for opening Apple products without scratching the hell out of the lovely finish) and a small crosspoint or Philips screwdriver. You can find both these tools in the “mobile phone repair kits” which you can pick up for a few bucks at hardware stores. The batteries in the Mini commonly lost charge over time, and in any case were only 600mAh, so you should buy a replacement like this one. You will also need a CF card to replace the existing Microdrive – any capacity will do, after all anything above the original capacity of 4Gb is a bonus. 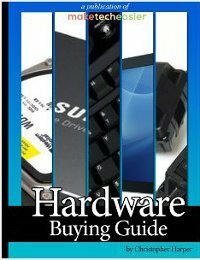 64Gb cards can cost around $50, but get the biggest your budget will allow. If you can’t find a CF card cheap enough, and you already have a high capacity SD card, you can instead opt for an adapter to convert the SD to a CF. First switch the iPod to HOLD and wait till the screen blanks. 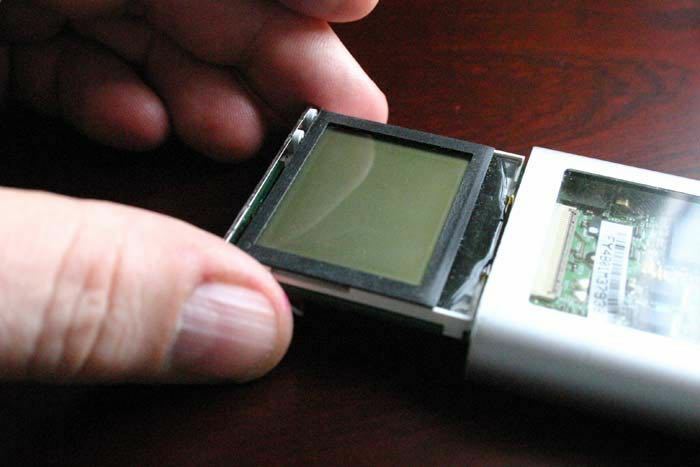 Opening the iPod Mini is easier than sothing like the Classic, but is still a bit of a fight. You have to pry the top and bottom covers off with the spudger (or even two) and these covers are very tight-fitting and glued down with rubber cement. You have to provide considerable force to do this, but do so slowly and carefully so as not to break the covers. It’s a delicate balancing act. Remove the sprung metal plate from the underside. It is fitted by four sprung clips at each corner. Then gently tease out the connector for the clickwheel using the spudger. Next press down with your thumbs on the click wheel and slide it out. If it’s hard to get out, leave this step till after the logic board comes out; it’ll be easier and safer. Now remove the two tiny crosspoint screws at either end of the top. 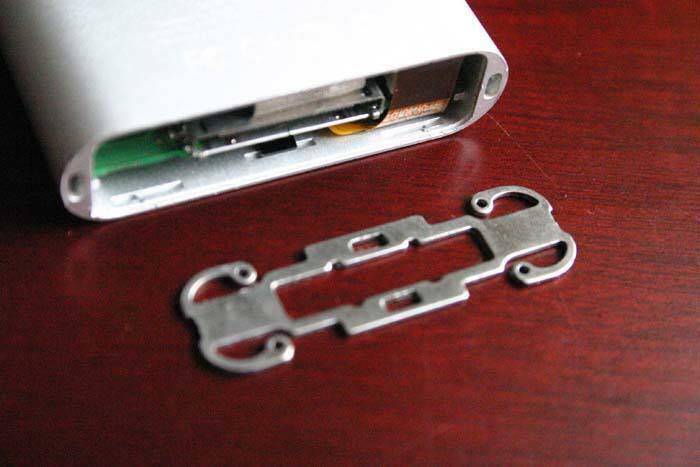 You can now carefully slide the logic board up out of the aluminium case of the iPod. 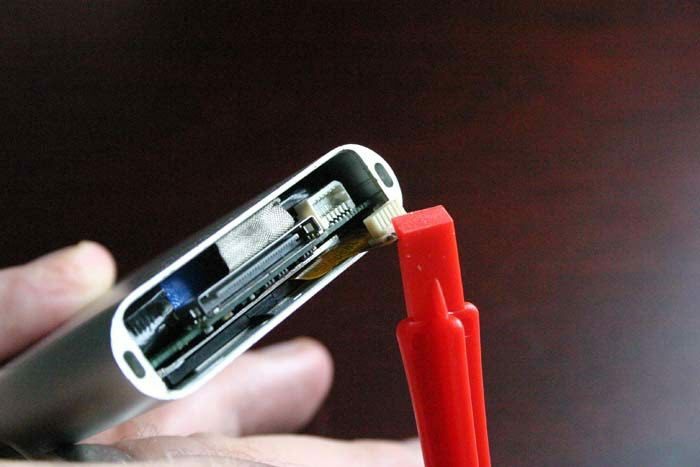 The battery is connected by a small white plastic connector. Ease this out of the socket with the spudger. It may be stuck to the logic board with a tiny sticky pad. 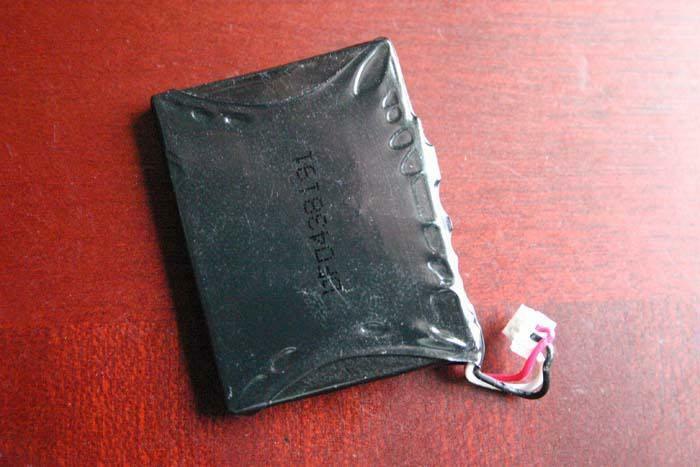 Gently remove this and put the old battery aside. 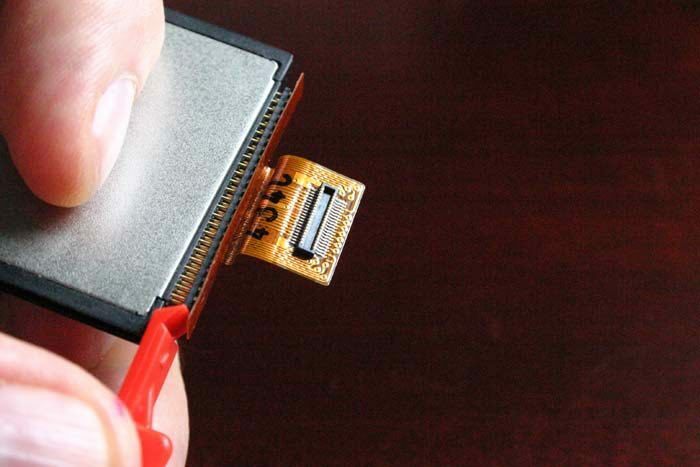 The hard drive is a Compact Flash-shaped Microdrive. This is attached to the logic board with a small flat connector. 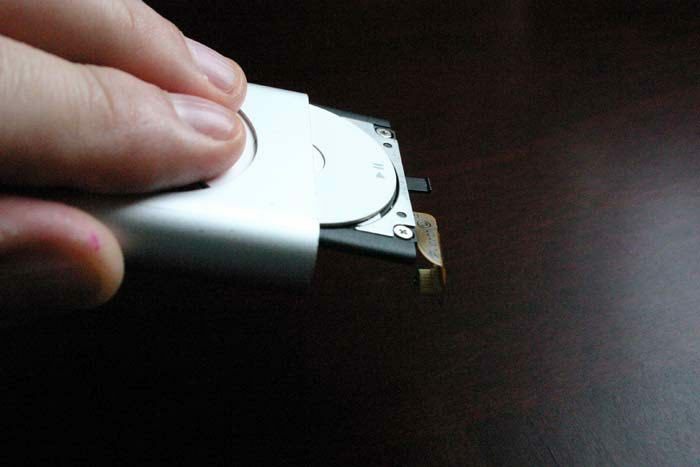 Gently push it away from the logic board on all sides; then the drive can be lifted away from the board. The drive itself is covered in protective tape and silicone rubber shock absorbers. Gently remove the tape and the absorbers. Make a note of which bumper goes where because you will be putting it back on the new memory. The cable plugged into the top of the drive must be eased out on all sides before being worked free, removing the pins from the drive. Now we are ready to put the new memory in the iPod. Take a new CF card of pretty much any capacity, 64Gb would be a good size, and make it comparable to high end iPods. To put it back together, you basically do the whole thing in reverse: Carefully insert the cable into the top of the new CF card. Wrap the CF card back into the tape and the shock absorbers. Press the drive cable connector firmly back into the logic board. Attach the new battery by pushing the plug into the socket. 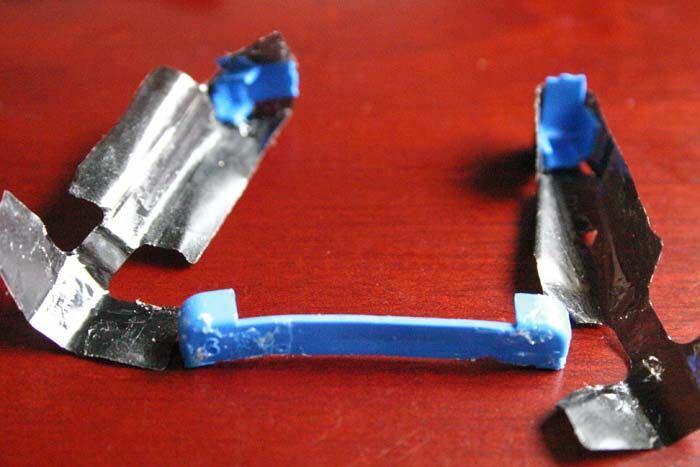 Train the wires around tightly so they don’t foul the case when you slide it back in. 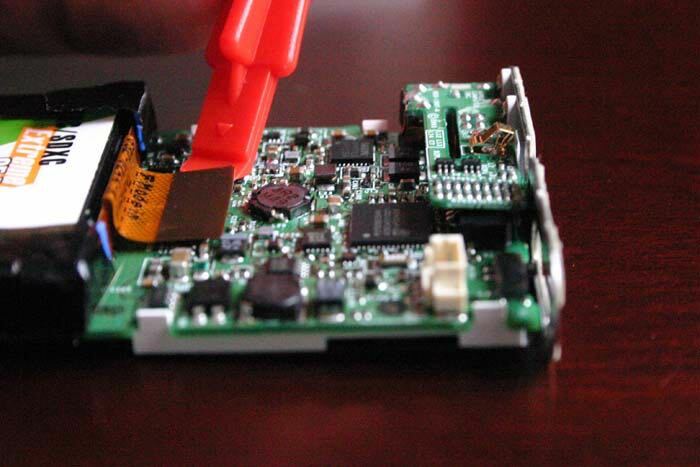 Be careful you don’t sever the wires as they are very delicate, especially on the cheaper replacement batteries. The next two steps are quite tricky. Slide the logic board slowly back into its slot in the case, taking care to push the battery wires into place. When it’s correctly seated, screw the two tiny screws back into either side of the top. Push down on the click wheel and slide it back into its slot until it pops back up into its hole. Be careful not to shave the edges of the wheel on the sharp sides of the case as shavings of plastic can gum up the click wheel. Remove any that are shaved off. If the logic board gets in the way, pull it carefully out of the path to avoid the click wheel pulling any components off the board. As with every other step of the process, use enough force to get it done but not enough to break anything. Put back the metal plate underneath by locating it on one side and popping in the latches on the other side. Put the top and bottom plastic covers back, adding a dab of latex glue so they stay down but are not impossible to remove should you need to go inside again. Attach a sync cable, and in iTunes select “Restore iPod” to format the drive and return the device to its factory settings. 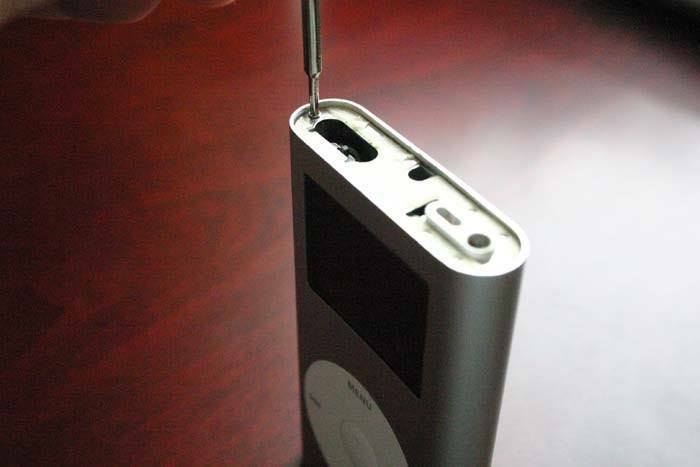 If you have had any experiences good or bad with refurbishing old iPods, let us know in the comments below. Very nice write up. With a 64gb sdhc card and adapter, plus new battery, you can have a decent iPod for half the cost or lower then a new one of only 16gb. Heck you can even buy one of these on ebay for under 20us and still come out way ahead of the game. Hi Emilio, sorry to hear you are having problems with the mod. I have a few thoughts. Firstly the iPods were never meant to be cracked open and modded to use solid state CF cards so Apple have never officially given an upper limit of storage for the Mini logic board, as far as I know. Sometimes the software or hardware have notional upper limits. In this case it’s an unknown. My gut feeling is while there is no limit in software, there is a limit to how big CF cards can be. I chose 64Gb as it was the biggest I could afford at the time, so it wasn’t because that was the upper limit. I would suggest trying another CF card and see if that works. Maybe there’s a problem with the logic board, which from the weird reset it might be. Have you tried taking it all apart and putting it back together again? Maybe there’s a loose connection/dry joint/bit of fluff in there somewhere. You can get new logic boards sometimes on eBay, and also Minis with broken hard drives too so perhaps if you get no luck with this one you can try again with another one. Best of luck, let us know how you get on. I didn’t have another CF card at home, but thought to try your suggestion of taking it apart and putting it back together to see if it was a bad connection. When I went to check the hold switch, the Apple logo came on, followed by the “plug in charger” screen. I had not seen anything other than the Apple logo and the “dead iPod” screen since the “upgrade”, so I thought to try it with iTunes again. At first it acted just like before, but having seen “signs of life” I thought to keep trying to “restore” it. About the 8th time it went through the process it was recognized as an iPod not on recovery mode and was able to sync it. Then I tried to change some of the audiobook playlists back to .aa format from the .aax that Audible decided my original iPod Touch required a few months ago. Oh gosh that was complicated. Sounds like there was a few other things going wrong there along the way. Glad you got it working in the end :) It’s a bit of a hack but as long as it works and you don’t have to sync it too often I reckon you’re ahead of the deal. Depending on the age etc. of the iPod you do get iTunes anomalies and crashes sometimes. But if you can get it working it’s the best. It’s a bit of a hack, but if you can get them working they are pretty decent iPods. And you can’t argue with the price! My own Mini is still going strong, but I think I got lucky that the logic board wasn’t messed up in any way, and that does happen.